Glad the flowers brought you some cheer this morning Judy. 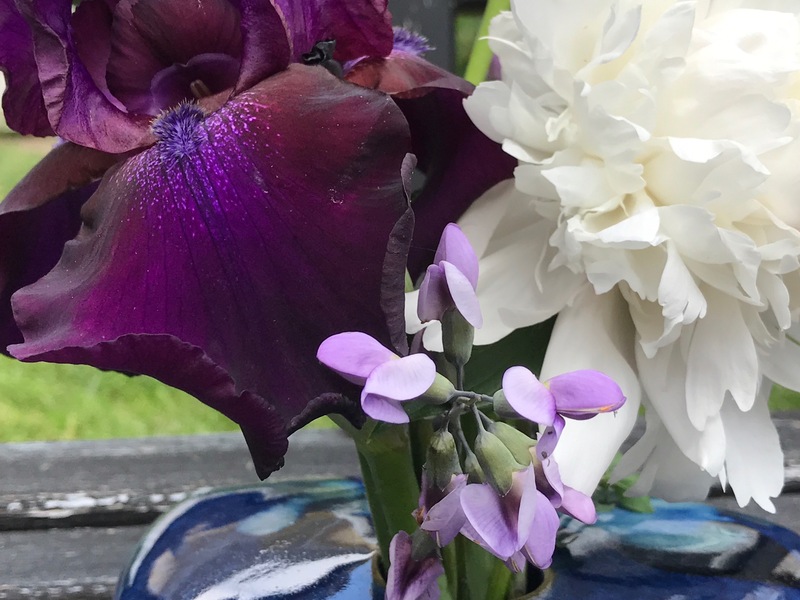 The irises and peonies have been so lovely this year. Thank you. Isn’t it wonderful that irises even exist? Such a marvel of nature. Mine are just beyond their peak now so even though I’m enjoying them, I feel a tinge of sadness knowing they’re fading away for another year. I still have a couple that haven’t begun yet but one is just finishing. I can’t believe that I didn’t grow them in my garden in England. The title is perfect. 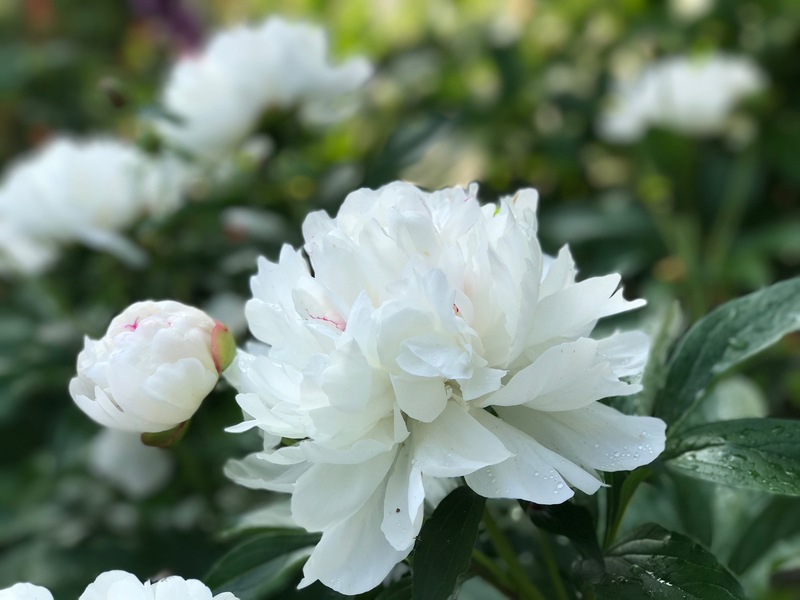 Amazing what you can grow there that I could not in Atlanta – Peonies and Baptista, Beautiful colors. Peonies like it colder than what our winters provide apparently, but I don’t want it any colder here and they make a nice effort anyway. 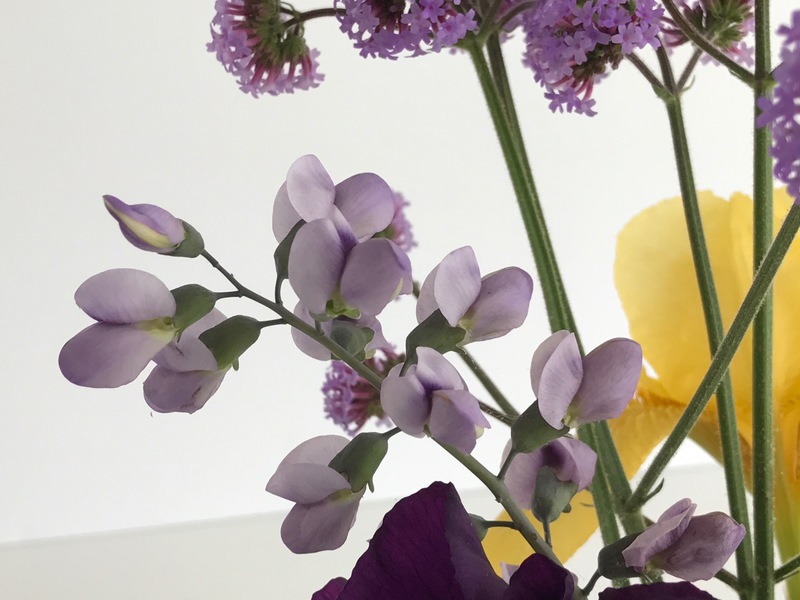 Baptisia is wild indigo–native here. 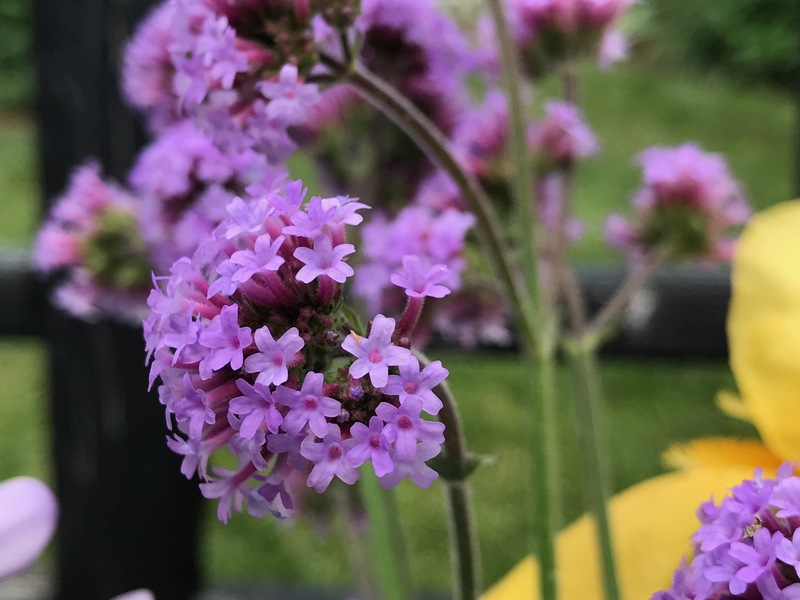 This particular one was discovered as a chance seedling in a trial bed at the North Carolina Botanical Garden in the early 1990s and brought to market by a local native plants nursery. There is also a lovely yellow form. 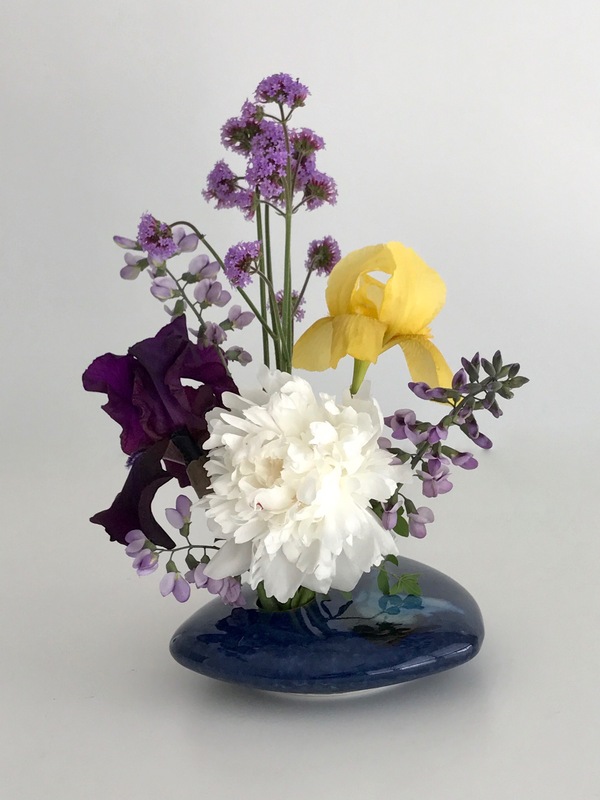 The yellow iris, though demure and understated compared to newer forms, gives this mix the “pop” it needs to bring the composition to life. I think you’re right Marian. Introvert that I am, this year I’ve come to appreciate the older forms of iris that I grow. I love the Baptista in this arrangement. The quote has the peony exactly right. Well done! Thank you. I’ve tried Baptista in several locations around the garden and this one has done the best. Something usually eats all the flowers (deer probably) as it grows outside the main fence, so I don’t mind cutting some of the blooms. 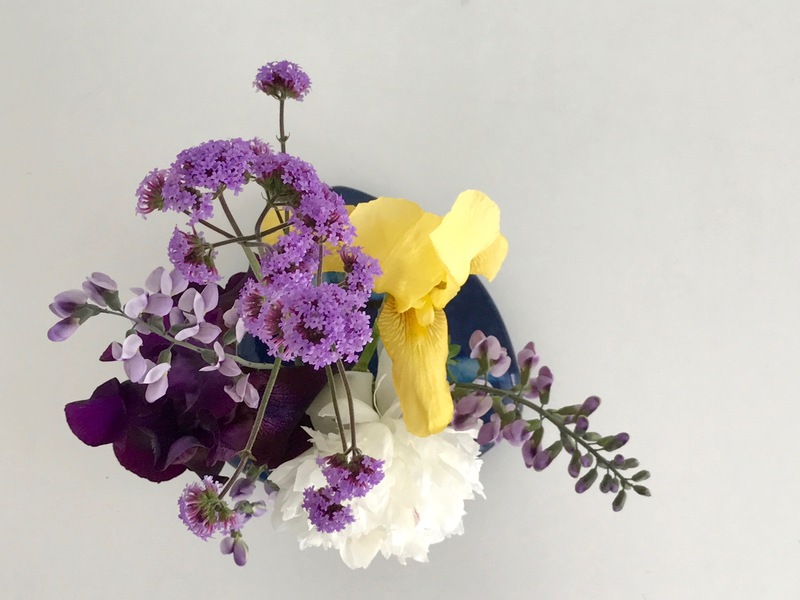 It surprised me that the first thing I noticed was the Verbena, not the peony! I have severe peony envy as you may recall. Yours is beautiful, as are all of the flowers you’ve chosen this week. As summer is closing in on us and my Itoh peony has yet to produce flower buds, I’m guessing our winter rains weren’t sufficient to do the trick this year. Kris, the verbena has been so nice in the garden this year. A flock of yellow goldfinches were perched on it for a moment, making a beautiful contrast. I’m rooting for that Itoh. The rich purple and the soft white, a lovely contrast. Thank you Alison. I’m a fan of both colors. Oh-so-lovely, Susie! 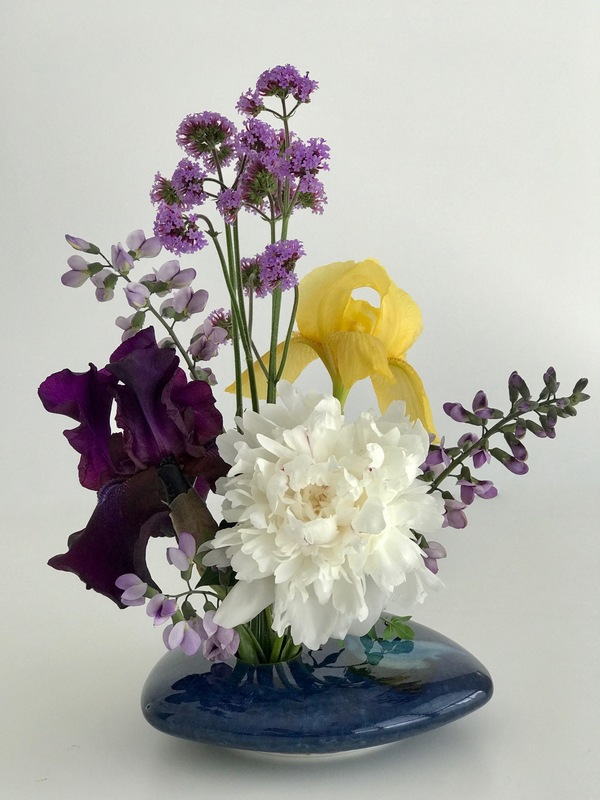 Peonies, iris, baptisia – I love them all! Thanks Eliza. I will miss the irises especially in another week or two. They’ve been so rewarding this spring. Festiva Maxima was the peony everyone had when I was growing up. I remember being fascinated by it. And Henry Mitchell was one of the first garden writers I ever read. I always remember he said that if you could not grow a particular rose because of your climate you should move! 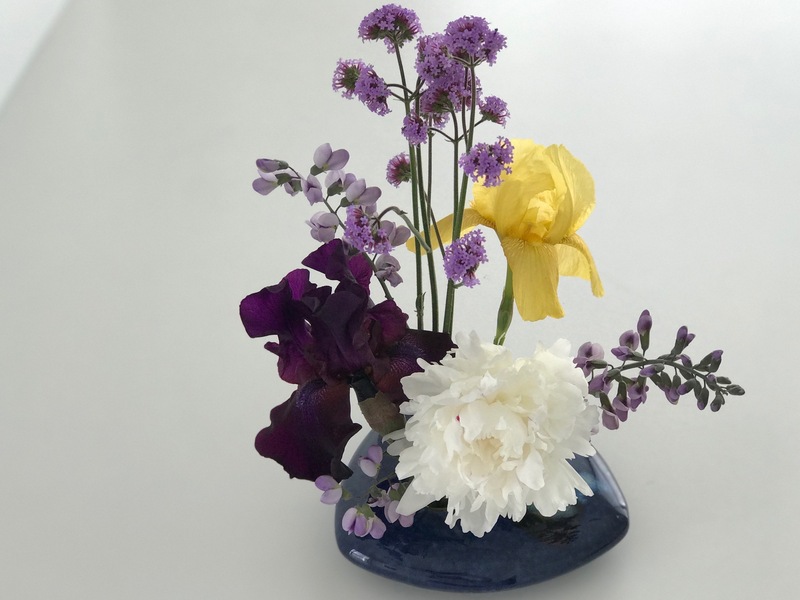 I would not have thought to combine the Iris with the peony but they work well, esp. when they are not all stem but more flower. I read this peony was introduced in 1851. Wonder if any survive? I should pull out my Henry Mitchell books–learned about him long after he’d died, but his writing is timeless. 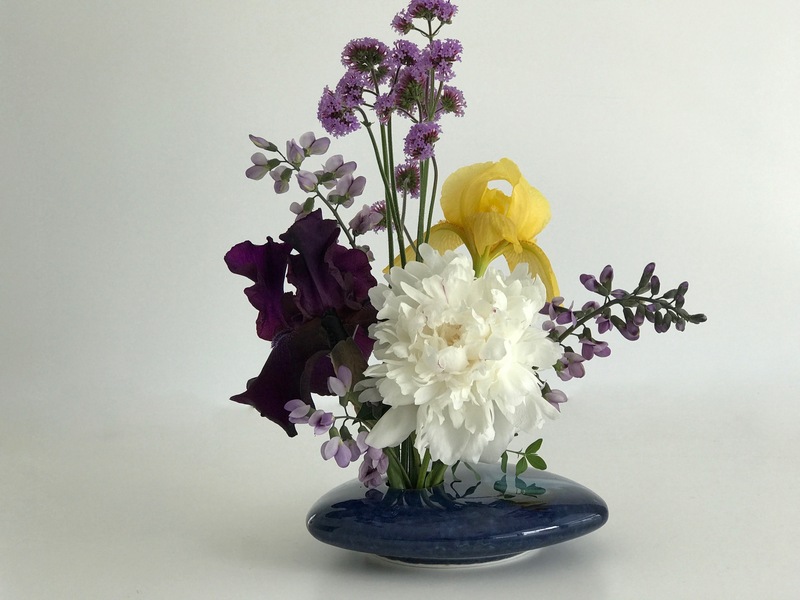 Lovely, I like how you used Baptisia, I don’t think you often see it in a vase. Thanks Jason, Baptisia is something I’ve never seen in a vase either but it has great character. The peony is beautiful, I have an no name one which I think could be festiva maxima. Brian, I had ordered some fancy peony and this is what the nursery sent. Took several years for it to bloom at all so I didn’t know for a long time about the mistake. Festiva maxima is easy to grow and has been happy here, so I’m happy too. I adore that peony. Also the Baptisia, which I hadn’t heard of but a quick online search tells me that it comes in a whole range of very tempting colours! Beautiful composition as always, Susie. Each bloom is exquisite. Yes, probably more colors every day. There’s a gorgeous yellow Baptisia called ‘Carolina Moonlight’. I know, I saw it – very pretty! Ooh, peonies flowering already? How wonderful! 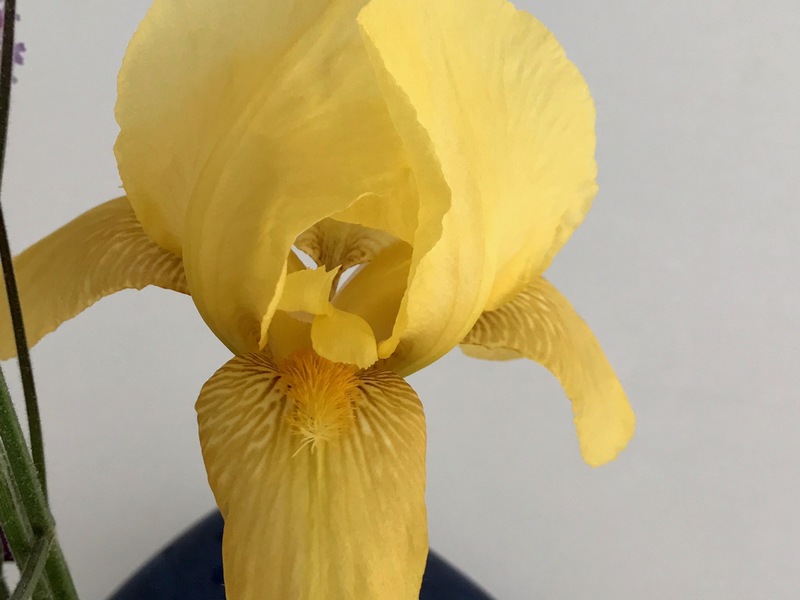 Love the combination with iris, and the description ‘fluff and majesty’ is very apt! Spring flowers are very early here, by one to two weeks on many things. These peonies are so exuberant they just make me smile. That purple iris is glorious. 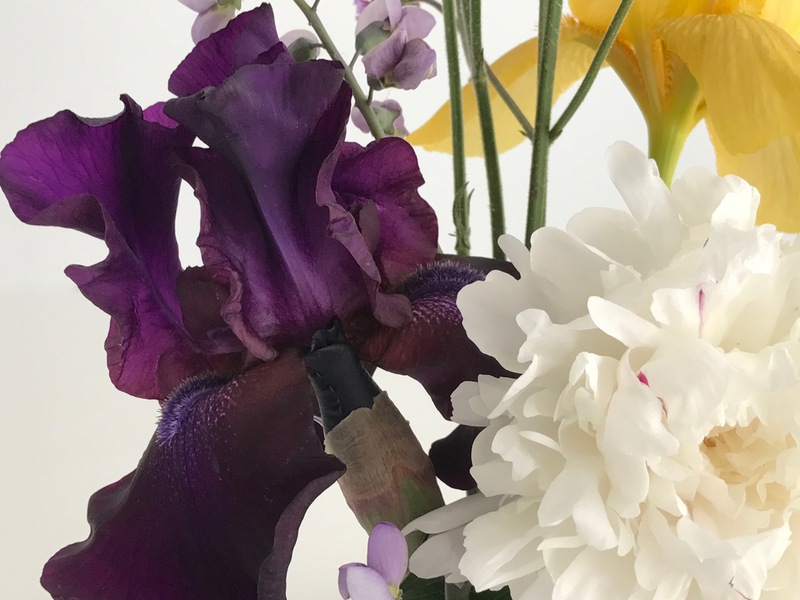 It’s a nice one–complex color shifts within the flower. That peony is so beautiful! They are just the ultimate Spring flower and I would love to grow them but it’s a bit too warm and humid. They have such majesty. I bet that arrangement is bringing you a lot of pleasure this week. Thanks Cath. Maybe someone will create a peony one day that doesn’t need that deep cold period. The earliest of my Irises are just beginning to bud up…something to look forward to. I hope I can use them as deftly as you have here. Why thanks Ricki. Irises are such special flowers. Hope yours open up soon.